One Degree. Two Countries. Three Universities. Infinite Opportunities. To meet the needs of a rapidly changing society and global economy, three internationally renowned institutions, Peking University, Emory University and The Georgia Institute of Technology, have forged an unprecedented partnership in biomedical engineering. The Joint Ph.D. program offers a unique means for U.S. and Chinese students to learn and work in a global economy and in global health settings. Program graduates will be prepared to become global leaders of innovation who can contribute to cultural, political, economic and health concerns in their home countries and around the world. 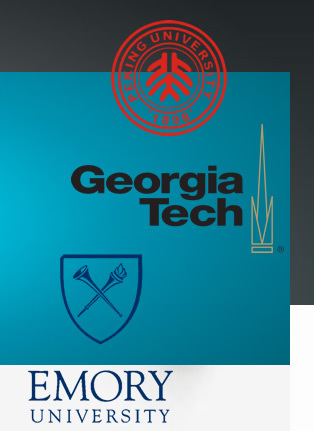 Students apply to the program through the school designated as the home campus, either the Department of Biomedical Engineering at PKU in Beijing or the Wallace H. Coulter Department of Biomedical Engineering at Georgia Tech and Emory in Atlanta. Students will have an advisor on the home campus and co-advisor on the secondary campus. Most of the classes and research will take place on the home campus. However, students will also spend at least one year taking classes and participating in research in the co-advisor's lab on the secondary campus. Most classes will be taught in English and a single dissertation will satisfy the thesis requirements of all three institutions. Students will be fully supported as long as they maintain satisfactory progress in the program. APPLY for the joint Ph.D. program!